World 6-A is the first secret level of World 6, in New Super Mario Bros. This level takes place in a desert, and it is the only level in the game that has tornadoes. 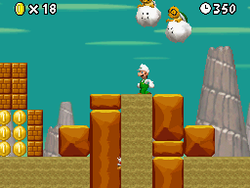 There are also Lakitus chasing Mario throughout this level. The first tornado allows Mario to obtain the first Star Coin. Later, Mario should be met with two Lakitus at once. The player should see a part of the quicksand that is higher then the rest. If Mario goes into it, it will take him to an area containing the second Star Coin. After the checkpoint, Mario should find an area with several pipes. Mario should enter the single yellow one to go to an area with the third Star Coin. When he exits out of a red pipe, he should enter the green one next to it. After exiting a Warp Pipe, Mario will reach the Goal Pole. Star Coin 1 - Mario should ride the first tornado and head right to get the Star Coin. Star Coin 2 - Mario should enter a pit of quicksand that is higher than the rest. He should fall in an underground area that has Spinies in it. Instead of falling down, Mario should Wall Jump. It is easier with Small Mario, as the gap on the wall is two blocks tall. Star Coin 3 - Before the end Pipe, Mario should head down a yellow Pipe after the green Pipe. If Mario tries to go up, he'll trigger Hidden Blocks with that contain Coins or a power-up, which means he'll be forced to enter (similar to World 8-4 of Super Mario Bros.: The Lost Levels in the final room). Mario should move left while avoiding the Super Piranha Plant. This will also lead to a red Pipe leading before the yellow Pipe that Mario or Luigi entered.